Home/Australian Open/Australian Open 2013 – Is Djokovic Unbeatable on Plexicushion? Australian Open 2013 – Is Djokovic Unbeatable on Plexicushion? Hey all, the start of the new tennis season is edging closer and closer with Brisbane, Qatar and Chennai all starting at the end of December, those tournaments don't matter a great deal as they're just tune ups for the main event so I thought I'd look even further ahead to the Australian Open which starts on January 14th. That's also the first time we'll be be seeing Roger on court as he's skipping Qatar and opting for the practise courts instead. With a somewhat disappointing indoor season I'll take a look at what can we expect from Federer in Australia and also discuss whether or not Djokovic is nigh on unbeatable down under. How will Federer perform in Melbourne? 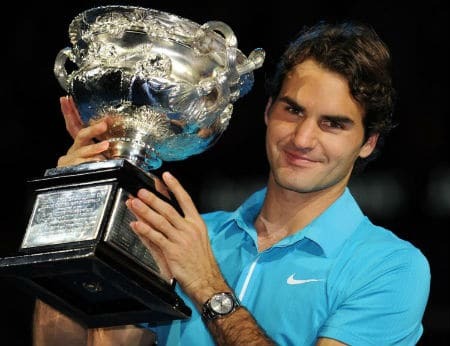 Roger last won the Aus Open in 2010 and since then it's been a disappointing tournament for him as far as I'm concerned. He's played well in the early rounds the last 2 years, almost looking invincible, before losing to Djokovic in straight sets in 2011 and then crumbling to Nadal in 4 sets in 2012. I think the surface is a little bit too slow, in my opinion, everything is already slowing down. Everybody's already complaining that, you know, we're playing too much from the baseline. So we'll only see more of that here in Australia, that's for sure. As I mentioned above, the courts in Australia aren't the quickest which doesn't really suit Roger's naturally attacking game. If he runs into great retrievers like Nadal and Djokovic then I can see problems for him. For the first 30 minutes of last years semi final Roger played tactically brilliant against Nadal but then fell back into old habits and lost the plot, spraying his forehand and allowing Nadal back into it. The same happens with Djokovic who is able to stay in so many points and Roger can't hit as many winners as he'd like. The second factor is how Roger has recovered in the off season, he looked burnt out in Shanghai, Basel and the World Tour Finals so it's important he's recharged the batteries. He looked full of beans at the Exhibitions in South America so hopefully a relaxing Christmas and then some practise sessions will allow him to hit the ground running when he get's back into competitive play. The most important factor in that list above is how short Federer can keep the points, this is important on all 4 surfaces but in Australia it's almost paramount to his chances. This is because the surface in Australia ruffs up the new balls incredibly quickly and that slows them down significantly. Fluffed up balls get heavier and travel through the air slower, that means longer rallies and that plays into the hands of players like Murray, Djokovic and Nadal. Slow courts and slow balls is a bad bad combination. If Roger can keep the points short, he naturally plays more confidently and he also keeps the balls fresher, which when serving out a set, could be mission critical as they'll fly through the air much quicker. I'd probably go as far as saying that Roger's chances of success in Australian hinge on how short he can keep the points. Any drawn out baseline rallies and I don't think it ends well for him. Side note: I know it's very early but I made a prediction early in 2012 on the blog that I'd be judging Roger's season on his Wimbledon performance, that turned out to be a wise move. This time around I'm doing something similar and I think the US Open is the one to watch next year and that's the tournament that I think will define his season. I thought I'd get it in early 😉 as it will also serve as a reminder to not get too downbeat if there's some tough losses in the early part of the season. Is Djokovic Unbeatable on Plexicushion? The big worry if you're a Federer fan is Djokovic, his record in Melbourne since the surfaces changed is imperious. I've said on forums and on twitter you get the feeling he's almost unbeatable on it these days. Since 2008 he's won 3 of the last 5 Australian Opens, he's only dropped 16 sets since 2008 (winning 88 sets) and he only dropped 1 set en route to his first win in 08 and then again on his win in 2011. Those are solid stats. Last year he defeated an inspired Andy Murray in 5 sets and then went onto out slog Nadal in a marathon final which will no doubt give him a lot of confidence when he returns there in January. The surface suits his game down to a tee; it's slow, which allows him to retrieve very well, but you can still play offensively on it which he often tries to do off the backhand wing. Novak is also great at still keeping his shots somewhat offensive even when he's defending and that always seems to work well for him in Australia. Really you have to say that Australia for Djokovic is almost like Wimbledon for Federer. It's where he won his first slam, he gets support over there and he just seems to be at home on Rod Laver Arena. It's kind of strange because he used to struggle with the heat, even retiring in 2009 because of it but since then it's become a second home for him and from what I've seen he looks more comfortable in Australia than at any other Grand Slam. 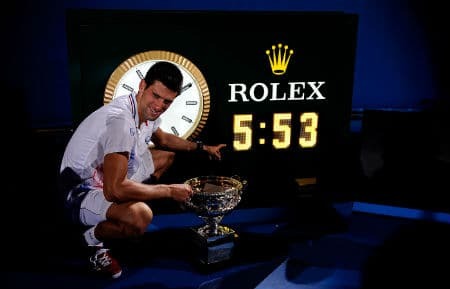 The way I see it, I think it's tough to see past Djokovic winning his 4th title come the end of January. Upsets can happen but it's going to take something special to really upset him. Perhaps Roger is the only one capable of doing that to be honest. Nadal and Murray can and have beaten him in Grand Slams before but if Novak is really on form then I think he beats both those guys, they're almost reliant on his level dropping to be in with a shout. Whatever happens it should be an interesting start to the year, it's Murray's first slam since his maiden US Open Victory, it's Nadal's comeback slam after a lengthy layoff, Djokovic is wanting to defend his title and stamp his authority down as the best player in the world and then we have Federer, playing without too much expectation but definitely wanting to put in a good performance to get his year off to a good start after a somewhat disappointing year end. All those things add up to provide some top class entertainment and I'm looking forward to it. What are your expectations for Federer in Australia? Do you think Djokovic is unbeatable on plexicushion? Well, I guess Djokovic will not triumph again. I really believe Federer will think of every sound tactic and approach to beat him. Let’s hope Roger will get the 18th grand slam! Hope so Pollux, if they meet of course! Nadal and Murray will be a factor too. Maybe there will be a surprise package too, you never know! Djokovic is def. the clear favorite going in to the first slam. The surface suits him perfectly. It won’t be the most likely senario, but I do think federer has a chance of upsetting novak at the AO. Ofcourse he would first have to make it to the final, which is not that easy either. I hope murray is in his half, as I give rf a better chance at beating him then Rafa. I know that nadal has been out for a long time, which might make him rusty and give federer a pretty good shot at him even on such a slow court, but for some reason I feel that roger will just mentally subcumb like he often does. I mean I always get the feel that when roger plays against him, he doesn’t only battle rafa but also his own game and state of mind. Anyway if he would make it to the final the most important thing for him would be his serve imo. The last two times they played at the AO, Roger broke Novaks serve quite regularly. The only problem was that he himself got broken a lot of times aswell, which is not that suprising considering Novaks returning ability, but still. So for Federer to have a chance his serve would probably have to be around 65-70%. He would also have to finish it of in either 3 or 4 sets, because if the match would go the distance I only see one winner. I would probably consider murray after rf the most dangerous player for a well playing novak. I don’t exactly know why, but for some reason Novak struggles with Andy’s game. Alot of matches they have played this year were extremly close and who knows perhaps next season Murray will have some luck on his side and ends up beating the Serb. The least problematic player for novak will be Rafa imo. Novak has the upperhand in there hardcourt matches. I know some Nadal fans will point to the last AO where it was very close and claim that it’s a sign of things to come, but I doubt it. I felt that nadal played one of his best matches ever in that final and it was still not enough to overcome novak. Sorry for the long post. I sometimes just keep rambling on. Yeah it’d be interesting if we see Fedal at this years Australian Open. You never know with Nadal how bad his injuries are or how fit he is so he could come out as good as ever. According to himself he never lost a match when fully fit. All his losses come when he can’t even run. Looked fine against Rosol though to me! Hard to see past those 4 guys though. Not sure who can make a name for themselves but we’ll see. Excellent analysis as usual. Novak is definitely the man to beat this year, and like you say I think Murray is the only genuine threat to Nole within the big 4. As ever, Delpo and Tsonga will have the ability to cause an upset, and guys like Tomic and Raonic will be looking to make a big impact this year. Should be an interesting one! I think Fed is best equipped to upset Nole just on the surface it isn’t easy. Can’t see Tomic doing anything, probably lose first round! I think that Roger has a chance I think after his exo matches in south america he is very but very motivated as the fans were awesome with him, so I think and hope that Roger will have a very good chance and I am agree with all of you that Novak is the favorite, but remeber that Roger is the GOAT the best tennis player in history so maybe he will have something to say. Merry christmas and happy new year to all of you and specially to you Jonathan please keep up with the good job my dear friend. Hi Luis, I totally agree with you. The crowd went insane for him. Just watch on Youtube the films what happened when he left the building or his car, they shouted for him lke a rockstar. He himself said that he loved it so much that he wants to play for a lot more years, because once he retires, he will not have this all. So I think he will do his utmost best to win AO 2013……… But there is Novak too….. Cheers Luis, Merry Christmas Fedmas to you too! Nice article. Good questions. I definitely know that Novak will be in the final. That’s for sure. No doubt about that. Hopefully so will Roger. If not, than it is definitely against Andy. This is for Novak and Roger a very important slam. If Roger wins, it will be his 5th. I don’t know if anybody has that much AO titles (unfortunately and honestly I love tennis, but I don’t know that much about the history). If Novak wins, he will have 4 and will be equal with Roger. So for those two it is very important. I really thought that Andy was invincible, but seeing the WTF SF against Roger…. I think Roger can win against Andy if they meet. But against Novak… the way he won the Shanghai final against Andy and the WTF against Roger, I pretty much think he is invincible. Novak will win AO 2013 for sure. Hopefully Roger can stop him. But what worries me most, is that what if Roger meets Rafa? If Roger wins, people will say, ah Rafa was not fit and Roger can only defeat an unfit Rafa. If Roger wins, then people will say, ah Roger only won because Rafa was not fit !!! I’m afraid Roger will not come out of that good. I think if he knows that he will meet Rafa, he will be worried. What if I lose again from him while he is unfit??? I so hope Roger does not meet Rafa or meets Rafa and wins. By the way, Rafa is covering himself that he will not win AO, but I think just like 2010, he will come back after an injury and win everything!!! Making people guess, what??? I thought he was injured?? Also the one person with a good chance is Del Potro. Unfortunately Tsonga will not have a chance. He lost both exo matches against Roger……….and Roger was not playing that good to be quiet honest !! Jonathan, I wish you could someway find the time to watch all of Roger’s exo’s and tell us how you think he plays. He went with almost every point to the net, which is good, because he wants to keep the points short, but unfortunately he does not defend well. And the players now know that he wants to go to the net, so they anticipated that. That is something he has to work on, defending, in my opinion. Ps: Do you know who you should watch out for? David Goiffin from Belgium. I think he will be someone to keep an eye on. Like I said to Sandra a Fedal matchup could be interesting. Who knows what to expect from Nadal, he’s smoke and mirrors, always injured when he loses, playing down his chances so he might come back all guns blazing. I’d like to think Roger can get one over on him in slam (it’s been a while!) but we will have to wait and see. I don’t think you should read into a players performance in Exhos though, they are just for fun. Tsonga lost but it’s not like he was really trying. Neither was Roger he was just out there having fun showing the crowd a good time. Guess the only benefit is he got to try out some shots in front of a crowd that he wouldn’t normally do but that’s about it. They have no bearing on competitive play. I think Roger defends very well though. In terms out staying in points he’s right up there just Murray/Novak/Nadal with their two handed backhand are able to defend more aggressively if that makes sense but in terms of blocking the ball back and keeping a point alive I think Fed is equal to those guys. Goffin is on my radar, he strikes the ball well, maybe a little small but he’s gone toe to toe with some big hitters so far and not looked out of place so he could be a new star. I think Djokovic definitely is beatable on the surface – he did lose to Tsonga in 2010. He nearly lost to Murray and Nadal last year, and he probably should have lost to Rafa, being down 4-2 30-15. And then Rafa let him back in by reverting back to his defensive shell. It’s certainly not impossible for Novak to be upset in the quarterfinals if he faces the right tough opponent, like del Potro. Nearly losing doesn’t mean a great deal though, because he’s still winning at the end of the day. I can’t see Del Po beating Djoker in Aus, he doesn’t have the stamina to. And Katyani, Roger is still the 5th best defender in the world behind Djokovic, Nadal, Murray, and Ferrer. Agreed, well kinda, they are all almost equal as they defend in different ways. Minus Ferrer though, no way you can put Ferrer above Federer in terms of defense man. Hi people, thank you for your comments on my comment. Like I said, unfortunately I don’t know that much about tennis or the terms. All I know is that I love to watch Roger play and some others as well. That he is the 5th best defender in the world, I did not know that. I just thought that during the exho’s he came a lot to the net, but after a while the others were anticipating that and were reacting to it. He came to the net on one side, leaving the other side wide open for the others to play the point. I know those were the exho’s, but still. I said 2013 will be Roger’s year, but unfortunately, he first has to go through Novak to win AO 2013. And after the two matches Novak had this year (Semi against Andy and Final against Rafa), I honestly don’t think anyone can beat him. Especially since, in my opinion, Roger gave his all in het WTF Final and it still was not enough to beat Novak. Lets just hope Roger can do it this time. He is giving some things up to practise more, so hopefully that will work out for him. And lets not forget that the others are practising too and had more time to do so. You can never win from Rafa !!! Ps: I like Jo Wilfried a lot. He is nice, respectful, goodlooking (which is not bad), but he is a very good tennisplayer. I just don’t know what he has lately. He seems to loose a lot, seems to be tired some what quickly and sometimes it seems that he is somewhere else than on court. I hope his new coach can help him a lot, because he can be very good. Conal, your comment leaves me worrying a lot and not hopeful for Roger for 2013………. I think it will be hard to beat Novak if I’m honest. Mainly due to the court being slow. Which helps Novak for exactly the reasons that you describe. Plus there is a confidence thing that Novak has I think. He won the last time they met and he won the AO last year. I couldn’t see the AO last year, so I can’t fully comment but that’s what I’d think. If someone were to have a chanced to beat him, it’d be Roger, I agree. And as for the others, it’ll be interesting to see what happens. There are a few others than the big four who could cause an upset, although mainly only thinking about Delpo at the moment. And Rafa’s back, but we have no idea what form he is in already. And as for Murray, Roger could def beat him. With them it depends on their form of the day and on Murray’s state of mind. If he is easily upset if things don’t go well straight away, Fed could take advantage of that and go for it. And as for 2013 in general: I don’t know what’s going to happen either. I think the US Open will def be a focus, that was mentally the hardest blow for him I think… So he’d even be more determined to get it right this time I’d say. All in all, massively interesting year ahead. All adds up to make an interesting year! It’s about time someone new broke through though! Yes this is so sad that the surface has been slowed down so much. I remember a year or so back Navratilova, after she had a hit up on the court, saying that it basically was as slow as caly. What I would desperately would like to see from a tennis jounalist is some investigation as to why the tennis authorities have been so focused on slowing down tournaments everywhere. It really surprised me that the Australian Open organizers are now competing with Roland Garros for the slowest court slow. This seems against the Aussi traidition of attacking tennis. Why isn’t someone investigating this? the tennis authorities and ATP in particular should have serious questions asked of them in relation to the disgraceful slowing down of practically ALL court types – including grass! And it was only back in 2008, the court speeds would be much slower now! Great find! I’ve seen that before but I’d totally forgotten about it. Will be very useful for a post I’m working on! Yeah I remember that, I think Pat Cash had similar feelings on it. He said that players like him and Rafter would get destroyed playing on courts that slow. It’s all to do with money unfortunately, slower courts = longer matches so fans spend more money whilst they are in the grounds on food, drink and souvenirs etc. Slower courts also protect higher ranked players because it gives outside players less of a punchers chance. Tournament organisers want to see Nadal and Djokovic finals because they know there’s more money in it for them be it in ticket sales, sponsorship opportunities and television broadcasting rights. The ATP and tournament organisers like Tennis Australia are just a money making machine like all other sporting organisations these days, money first, the game second which is a sad but true reality. Can I ask you a question I really would like the answer to? In a previous post you mentioned that Roger is not playing Basel, because of differences he has with Roger Brennwald. Roger wanted to buy the tournaments outright, but Brennwald did not want that. Can you explain what you mean and what this is all about? I know it has nothing to do with this article, but I really would like to know this. As far as I’m aware Roger wanted to buy the Basel tournament from Brennwald so that he effectively owned the tournament. I’m not sure if that was when he was with IMG or after they had split. But either way Brennwald refused and said it was not for sale. I think what then happened was Brennwald leaked details of Roger’s 2013 appearance fees to the media so the Swiss Press portrayed him as greedy. Their negotiations broke down and as of yet he’s not playing Basel next year. I understand you are a Federer fan but how can you claim things like this without any evidence or proof? Tell me a source where Rafa said this. Tell me when did he complain about injury after those 7 beatdowns vs Djokovic? I know Rafa is not perfect but please try being objective as a blogger. I’m not looking to be objective. That is the job of journalists, fence sitters and other tennis bloggers who don’t want to have an opinion that might ruin their “blogging career”. I’ve done plenty research, if you have a look around the net you’ll see that the vast majority of times that Nadal has lost a match to a lesser opponent – Soderling and Rosol especially he’s come out long after the match and talked about injury. If you watch the Rosol match there’s no way Nadal is hampered. He ran into a better player on the day. It is not a rule but the seed n.1 and n.3 are often in the same half of the draw (the seed n2. and n4. are in the second one). If this is gonna be the case than Roger will play Rafa and Andy will play Novak. I personally don’t see Rafa in the finals of AO 2013. Let’s look back at the end of the season 2009 – Rafa didn’t play Wimbledon due to his knee problems and he came back at Shanghai. You could have seen Rafa playing short balls. Moreover he moved well but he seemed to lack strength. I can see Nadal reaching quarterfinals, possibly loosing to guys like Berdych and Tsonga. If they are not able to stop him, than Roger difinitely should be able to upset Rafa. If Nadal is not playing his top tennis, than he becomes and prey instead of hunter in every match between these two. Murray is not likely to beat Novak at AO for numerous reasons – head to head score, speed of the surface, his mental strength. A lot of people can argue that this is not true, however in the end it is gonna be Djokovic in the finals. In the finals I would expect a similiar match to the ones Djokovic and Federer played in 2011 and 2008 at AO. A few commentators compared Djokovic to a wall – this is Federer’s biggest problem against Djokokic since 2011. The speed of the surface does not really matter in fact. A lot of people stand for the opinion, that Djokovic beats Federer thanks to the slower surfaces on the tour nowadays. Jesus, look at Dubai finals 2011 – possibly the fastest surface on the tour. Federer won only 5 games. Than in the semis of US Federer lost in the fifth set, after loosing two match points while serving for the set. is a perfect example. Isner played huge serves and he won most of his volleys. Federer often uses this tactic against baseline players (clay experts) such as Ferrer, Nadal or Murray. Both Federer and Murray are now able to play like this (Murray not that significantly) and this turn things around. If Djokovic doesn’t get the proper rhythm, like he didn’t get in the RG 2012 finals, he could failed to win a match on plexicushion. Thanks for the comments. I agree with most things you said but not sure you can say the speed of the surface doesn’t matter for Djokovic when playing Fed. Those 2 US Open losses aren’t really a good indicator, as Roger should have won both those matches, had multiple match points. Wimbledon this year proved that on a court thats a little nippy Roger is able to dictate play because of his agressive play. That’s a lot harder to do on Plexicushion because your opponent has plenty time to get the ball back. Maybe you’re onto something with the Isner tactic. But his big serve played a huge part in that match. I might have expressed myself in a wrong way. The type of surface plays a role in their matches. You are absolutely right about their matches at the 2010 and 2011 US Open. Federer dominanted on the American hardcourts every time they played against each other since the beginning of 2011 and he dictated the rhythm in the Wimby semifinals. He really has a better shot at faster surfaces. What I was trying to say is that no matter how fast the surface is, Federer should always be as agressive as he could possibly be. If we look at matches that Djokovic lost in the season 2012, we can see two names stepping out – Isner and Nadal. What I mean to say is that Isner destroyed Nole by huge serves; then Nadal completely changed his tactics since his losing streak against Nole in 2011 – their average rally speed increased thanks to the fact that Rafa just hit the ball harder and he also played risky shots close to the lines. And both of these guys beated Djokovic on the slower surfaces (I would say that clay in Monte Carlo, Rome and France is slower than Plexicushion). I am not necessarily arguing that playing volleys and big serves can help Federer but some kind of change in the rhythm could pay off. As you said, it might be hard to do these kind of things on Plexicushion. Still I think it is the only way how to beat Novak. Hi Jonathan, happy new year! I’d have to agree that given his record in recent years at this event, it would appear to be wrong, even disrespectful, to do anything other than put Djokovic top of the favorites list. His turnaround began, in my opinion, at the 2010 US open when he defeated Federer. That, for me, was the turning point for him. Since then, we all know what he’s achieved… Murray will be my second favorite, and then Federer. The slow nature of the surface does play more into their hands than Rogers. Federer is cunning and has given himself his best chance to win in Melbourne because of his clever preparation, but to be honest, I don’t expect him to. However, I have enormous faith in Roger, more so than in anyone else. He can beat Djokovic on Rod Laver arena, but his tactics would have to be spot on, and he couldn’t have dips. But Melbourne will just be the first stop for Federer, and although Tthe Australian open is a Major, it’s the “least prestigious” (in my humble opinion), his season will be judged on his performances on his performances at the 3 other Majors. That’s the way I see it, but I’ll be happy for you to disagree with me. With Federer, at the end of every year, the one thing I look back to with most interest is his performance at Wimbledon, it’s like Nadal at Roland Garros. So I’d have to say Wimbledon and then Roland Garros are the 2 big ones for Federer this year, very closely followed by the US open. I have Roland Garros on a par with Wimbledon because if he wins Roland Garros, it would be his biggest achievement I believe. That is, of course, on 1 condition: that he beat Nadal on the way to doing so. When he won in ’09, he didn’t play Nadal, his record against him at the event is 5-0, and 8-2 in Majors. People say it’s a truly great rivalry, and it is, but if I was Federer, by the time I retired, I would desperately want to improve those numbers and a triumph against his nemesis in his own back garden, better known as Court Philippe-Chatrier, would go a very long way to doing so. So you said you thought the US open would be the main thing for Federer this year, I agree, it would be huge, but not “the” big thing for old Roger Federer in 2013. Cheers Theo. Happy New Year! Yeah Djokovic is 6-0 in sets vs. Roger in Melbourne since they changed surfaces. It’s his favourite slam I think. Like you say Roger will have to be smart and serve really well if he’s gonna win there. I’d love for him to beat Nadal at the French. Would be the icing on the cake. He may have blown his chances with that though, he was too arrogant in 2005/06/07 and tried to beat Nadal at his own game when if he’d played tactically smart he’d have beaten him. Still a chance I guess, if Nadal ever makes it back. Something just tells me Roger is wanting the US Open this year. He’s done poorly there last 3 years (similar to Wimbledon ’10 & ’11) and he needs to right some wrongs on Arthur Ashe. He’d also be able to break another of Sampras record and easily become the best hardcourt player of all time. Even though he’s probably there already. I don’t know if he was arrogant in ’05, ’06 and ’07 ahead of his matches with Nadal at RG, but whatever he was thinking, didn’t do’em much good! Well, only time will tell on that one. I really hope Nadal makes it back to his best and that he’s able to stay there, tennis has a big void when Rafa’s sidelined. Anyway, I’m sure Roger’s far more relaxed about it. I don’t think he was arrogant ahead of the matches, more just during. He is a stubborn guy but also with a touch of arrogance. Most sports stars need it a little bit but against Nadal it was his downfall especially in those early French meetings. He tried to win from the back of the court just because he wanted to show he could do it. Yeah shame they never met at Flushing Meadows, although if this year is anything to go by then next year they’ll have made the court even slower again. Was daft they made Ashe slow and Armstrong a bit quicker just to protect the top players who were likely to be on Ashe more often.